The local conservatives have expressed their real family value in the comment below. A conservative poster under " Anonymous" used the following words to describe Wisconsin teachers and I assume all teachers and public servants across America. Is this the kind of people Americans want in leadership positions? I consider myself a local and I am conservative. I have great respect for our teachers and teachers everywhere. I home schooled only 1 child. And, my only other experience with teaching was tutoring for a home for orphaned boy's home. And, I still am sure that I am not aware of the stress of the responsibility for the education of a classroom of children and young people. It is an awesome responsibility. And, I am acutely aware, as observed numerous times first hand, that many teachers pay for supplies (and have for years) out of pocket. I would have to agree that lack of respect for our teachers is a big problem. And, while the unionization has created problems with retention of less than adequate teachers; it has also protected teachers who have dared to speak out about the conditions under which they are required to teach and/or poor administration. There are issues that need to be addressed - I think most teachers can agree with that. And, government employees are just now realizing what the private sector employees have been dealing with since the early 80's - a cut in pensions. There was a mass exodus from pension plans in the 80's by the private sector corporations because of the excess assets that would revert to the corporations. The government imposed tax penalties for these reversions and that slowed the exodus. However, as it became increasingly harder for corporations to fund these plans and as the government imposed higher premiums for insurance to guarantee benefits and imposed stricter funding requirements, the exodus continued to spiral. Now, very few corporations offer lucrative defined benefit pension plans; however, government employees have continued to have this luxury. And, now, it has come to the point that the private sector employees can't afford to pay the taxes to keep up those pension plans. The funding of these plans are highly dependent on the investment performance of the assets of the plans. This is very volatile. Any shortfall in investment performance becomes the burden of the entity funding the plan. This has proven to put a lot of unexpected burden budgets everywhere. The government couldn't protect the pensions of the private sector regardless of the laws they passed, incentives and disincentives a like. And, over the past 2 years, private sector small business employers have been terminating their profit sharing and 401k plans to gain access to their own retirement benefits to keep their businesses running. The same is coming home to the government. Its a simple truth. The thread makes a good point. It is the teachers that spew liberal socialist propaganda to students. It used to be blatant that you couldn't get a job with the state in North Carolina unless you were a Democrat. I have no problem with collective bargaining, and I don't see any reason to outlaw it. What I do have a problem with is the idea that I could be forced to pay a labor union to negotiate on my behalf, when I wish to represent myself in any labor negotiations. Could someone please explain that to me? If I were charged with a crime, I would have the right to represent myself, right? So why should I have that freedom of self-representation denied in an employment scenario? I would really like to know the truth on this. Why does the labor movement push to deny individual freedom? Mike...I can answer your question as it pertains to the private sector. I don't know what the rules are for employees of the various states - they vary. Wisconsin, for example, apparently requires all of it's employees to pay union dues whether they want to belong to a union or not. It's a condition of state employement. N.C. does not have any similar requirement and the NC state unions function more as lobbyists than they do as unions. In private industry, under the National Labor Relations Act, once the employees of a bargaining unit have certified a union as their exclusive representative, then the labor contract reached, while ostensibly if intended to benefit the employees, is actually an agreement between the Union and the Employer. The Union has the EXCLUSIVE right under the NRLA to represent the employees in that unit (whether or not they are members) on all matters relating to "hours, wages, and conditions of employement". So...the answer to your question is "no". The employee is not a party to the contract and cannot represent himself. These conservatives are willing to attack pensions that have in good faith been promised to these public workers; pensions that they pay into - not having bonuses, yet they fail to mention that the Bush tax cuts were extended for the poor, rich folks that can barely squeek by on $250,000 or more a year. We are a part of the dismantling of Roosevelt's New Deal that has brought unprecented prosperity to Americans from the 30s to the 80s. With the Reagan election, government became the bad guy...now we are at the hands of the corporations and a Congress that has been bought and paid for. As for the republicans, they harbor the impression that they have the control...not so, corporations do...and when that realization hits them it will be too late for the to pull their ideological head out of their bloviated arses. I think we all agree we dislike oppressive government. Which do you think will have the greater voice with government you a lone voice or a teachers union representing thousands of teachers? I've become aware that the vast majority of posters here know very little about labor history in the US. I was going to post a few comments of my own, but after coming across a recent Associated Press article about Pete Seeger, one of my lifelong heroes, I thought I'd let him speak for me. The article is entitled, "Folk music legend Pete Seeger praises Wisconsin effort against bill on collective bargaining." 1. "Maybe the Republican governor, he's done us a favor by bringing the problem to national attention," the 91-year-old Seeger said in a telephone interview from his New York home. "It shows the whole country how much we need unions. We may end up thanking him." 2. "Without collective bargaining rights we'd be right back to primitive times," Seeger said. "The average American, I think, looks upon unions as a standard way of doing business. Just like you pay rent, you pay taxes, you also get paid a decent wage because of unions. It's not because of the generosity of the employer." 3. "It shows me that Americans are still Americans," he said. "You don't become an American by saluting at the right time or singing the national anthem at the right time. You become an American by using the rights which the Constitution gave us." Yep....If you want to know about labor/management matters, a folk singer is usually your best source. I am not asking who would do a better job representing me. I am asking whether or not you believe I should have the freedom to represent myself, or if I should be forced to pay someone to represent my interests when I do not desire their participation? I appreciate your response, but my question was not a request for clarification of the negotiating power of labor unions. My question was intended to be more philosophical in nature, to ask why an individual would be forced to pay for representation of his or her interests when the individual does not wish to hire the union who provides those services. You can see from Liberal POV's response, he cannot even comprehend or accept the fact that anyone could possibly not desire that assistance, but I assure you, there is at least one person who never wants to be part of a labor union. Me. So then why force it on people? 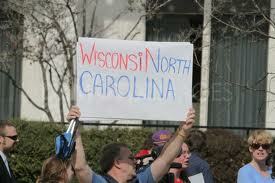 You are in NC - a "right to work" state and thus can not be required to pay union dues or to belong to the union. I'm not at all happy with the use of my tax dollars supporting a corrupt military complex of waste and unnecessary wars. Having said that I don't want to be a army of one when we do have to defend our interest or security. I don't always agree with the police or their tactic but I don't want a socierty without police. Union are much the same, I may not always agree but life for wage earning working Americans is screwed without labor unions. The Wikipedia articles on "Right-to-Work" laws (NC has) and "Union Shop" have some good information on the questions you raise. "Closed shops," of course, are prohibited by the Taft-Hartley Act. Here are some of the arguments the AFL-CIO uses on a page with the heading, "Right to Work Hurts Everyone." They argue that states with such laws: 1).have lower wages; 2).have fewer people with health care; 3). have lower workers' compensation benefits for workers injured on the job; and 4). have more workplace deaths and injuries. I can't speak to the validity of these claims, but that is what they say. "By protecting the right of the individual to be free, the material benefits of the collective suffer." Although I had never read that before you posted it, that is exactly what my presumptuous mind had guessed. Here is the problem. The AFL-CIO, as evidenced by that statement, places no value on freedom. This is what bothers me so much about tying the Middle East freedom protests to the pro-union Wisconsin protests. The people in Egypt and Libya aren't protesting for free health care and better working conditions. They are protesting for freedom! Freedom, in spite of what the labor bosses want us to believe, is far more valuable than what they are fighting for. Perhaps my all-time favorite one-page fable, The Moth and the Star, by James Thurber, can explain my feeling better than I can.